Geneva – IOM, the UN Migration Agency, reports that 28,368 migrants and refugees entered Europe by sea through the first 143 day days of 2018, with about 38 percent arriving in both Italy and Greece, and almost all the remainder (23%) arriving in Spain, excluding 47 migrants registered as arriving in Cyprus. This compares with 60,518 arrivals across the region through the same period last year and about 193,333 at this time in 2016. Also worth noting: in the month of May arrivals to Italy rank third – trailing both Spain and Greece, which recorded nearly two and a half times more arrivals than Italy (see chart below). IOM Rome’s Flavio Di Giacomo noted that the 10,808 migrants who are registered as having by sea to Italy this year represents a 79% decline from levels reported last year in the same period, when 50,524 irregular migrants and refugees arrived in Italy and a 70% decline from the 36,184 arriving to this point in 2016. 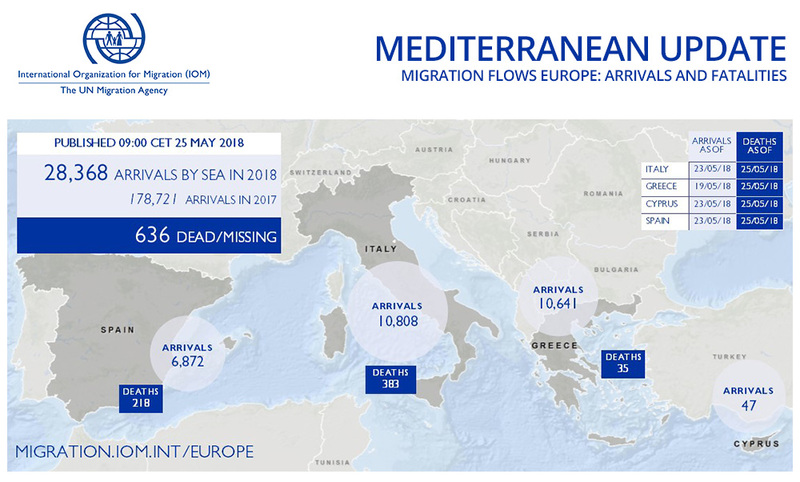 Arrivals to Italy through the first three weeks of May are about one-tenth of last year’s May volume, and one-sixth of that of May 2016. (see chart below). IOM Greece’s Kelly Namia reported Monday that over three days (20-22 May) the Hellenic Coast Guard shared details of two incidents requiring search and rescue operation off the islands of Lesvos and Samos. The Coast Guard rescued 76 migrants and transferred them to these islands. Namia reported that besides those 52 who were rescued, another 87 arrived during these days, also landing on Megisti and Kos, bringing to 10,641 the total number of irregular migrants entering Greece via sea since January 1—for an average of around 75 persons per day. In Spanish waters so far this year IOM Madrid’s Ana Dodevska reported Thursday that a total of 2,245 migrants have been rescued on the Western Mediterranean route through 23 days in May – compared with 835 for the entire month of May last year. That brings to 6,872 the total number of men, women and children who have been rescued trying to enter Spain by sea this year (see charts below). From 1 January 2018 to date, 75 per cent of the migrants (6,872 individuals) are arriving via the sea route; the rest (2,233 individuals) have been detected using the land route to Ceuta and Melilla, Spain’s African holdings. Worldwide, IOM’s Missing Migrants Project has recorded 1,134 people who died or went missing while migrating in 2018. In Europe, the remains of a young migrant were found in a forest near Montgenèvre, along the dangerous route from Italy to France that crosses the Alps. This was the second body retrieved in this area this month; on 9 May a 21-year-old Nigerian woman was found dead on the Durance River. Also this month, on 21 May, a young Moroccan man drowned in the Kolpa River, on the border between Croatia and Slovenia. His body was recovered by Slovenian authorities, and the circumstances of his death are being investigated. This is the seventh drowning recorded in this river since the beginning of 2018. There were several other additions to the Missing Migrants Project database since last Tuesday’s update. In Turkey, a migrant from Afghanistan died on 22 May in a vehicle accident in Bayramli, Van province, near the border with Greece. Approximately 70 other people were also travelling in the back of the truck and survived. In Mexico, a 42-year-old Guatemalan man was shot and killed in the Mexican state of Oaxaca when the truck in which he was travelling with at least 100 other Central American migrants was ambushed by armed criminals, also on 22 May. Last weekend, seven children from the Democratic Republic of the Congo drowned in Lake Mweru, on the border between Zambia and the DRC. These lives were lost in this tragic and disastrous accident on 19 May. In addition, the Missing Migrants Project recorded two deaths on the US-Mexico border. A 37-year-old man from Nuevo León, Mexico was found dead on the border of Chihuahua and Texas last week. On 23 May, a woman was killed after crossing the Mexico-US border into Webb Country, Texas. Her identity remains unknown.